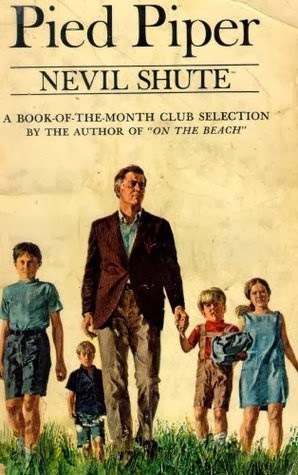 Nevil Shute's Pied Piper was one of the books I discovered while riffling through my father-in-law's library recently. The name sounded familiar - maybe I'd seen one of his books in my parents' library. And the concept sounded interesting. I started reading, and was hooked within a few pages. An old Englishman travels to southern France for a vacation, and is stuck in a war zone when the Germans invade earlier than expected. An English couple at his resort asks him to take their children back across to England with him. The rest of the book is about his arduous journey with the children across France to England, trying to avoid the advancing German army. On the way, the group has many close shaves. Somehow, the Englishman also manages to add to his group - he picks up orphaned children of many nationalities. It's an unusual book, surprisingly well-written. I had initially been under the impression that Shute was one of those pot-boiling thriller writers - but I was mistaken. Shute develops a believable cast of characters, sets his scenes carefully, moves his plot along quickly. I followed the little group's many narrow escapes with bated breath. Shute also develops a subtle side-plot, where the Englishman comes to terms with his son's death in the war - his son's untimely death is in a way one of the reasons he manages to successfully make the journey. As I was reading, I followed their journey across France on Google Maps - I couldn't find the little mountain village they started from, but I traced their journey from Dijon across Tonnerre, Joigny, Montargis, Pithiviers, Angerville and Chartres all the way to the coast. The book is a little nationalistic, of course - the Englishman is apparently the only one kind enough to help out the orphaned children. "I'll never understand you English," says a young French woman. But then, the times probably needed a hefty dose of nationalism.